It’s Valentine’s Day this week and we have some great ideas for those of you who are stumped for a good gift or looking for a truly romantic gesture. Kenya is home to a truly Out of Africa experience and as this year sees the 30th anniversary of that wonderful film starring Meryl Streep and Robert Redford we think it’s perfect for a Valentine’s Day celebration. If you haven’t got time to get there this year then maybe you could book it now for a trip later in the year – after all who doesn’t like to receive a pair of tickets to a romantic destination as a surprise? We recommend staying at many different romantic lodges and tented camps in Kenya. One of the most romantic is the recently opened Angama Mara in a private conservancy on the edge of the world famous Masai Mara National Park. 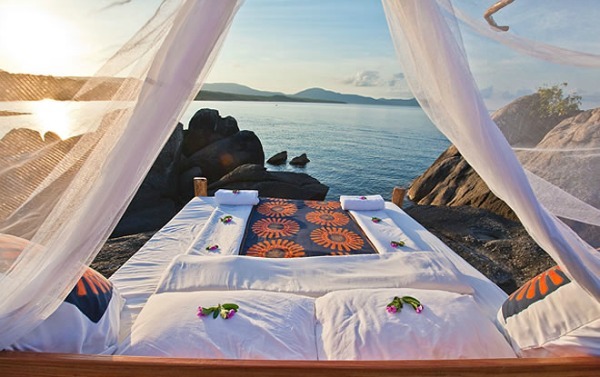 This is an incredibly romantic place because of the absolutely breath-taking views. These are so spectacular it’s almost impossible to drag yourself away from the camp to go on safari! 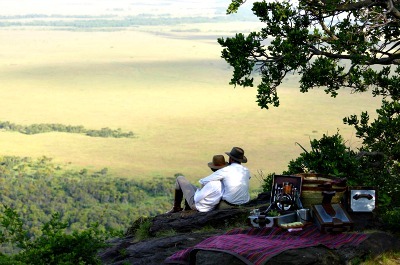 Each tented suite enjoys a 180° view over the beautiful Masai Mara stretching out far below. The Masai Mara is the best-known game reserve in the world, home to the Big Five and the world famous Migration which runs from July to October of each year and also the home to some truly stunning African scenery. The Out of Africa back-story adds romance and the tented suites are decorated in traditional romantic safari style with extra touches of luxury making it feel even more special. The staff at Angama Mara also go out of their way to make sure your stay is special and you will have some incredible memories to take home with you. 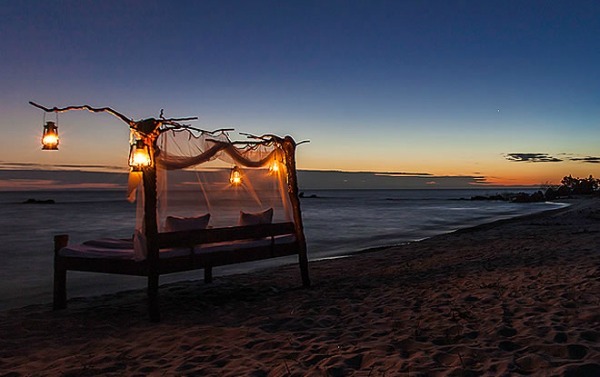 Other than Kenya two of our other favourite places for romance are the intimate and luxurious tented safari camps of Botswana and the luxury hotels on the shores of the stunningly beautiful Lake Malawi. In both these places we can off the exceptionally romantic experience of sleeping under the African night sky in a star bed. You can’t get more romantic than that! 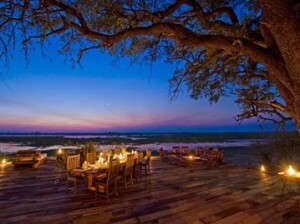 This little camp is a hidden jewel on the Xudum River in the Okavango Delta. The area is home to a long line of little islands dotted with lush greenery and trees interspersed amongst the rivers and lagoons. As you would expect the Okavango is filled with wonderful wildlife and you can take the camp’s glass bottomed mokoro canoe to make the most of it. The camp is tiny with only seven spacious twin and double-bedded safari tents each with an en-suite bathroom. The tents are well spaced apart which means they all feel very private without being too far from the main camp area. New for 2016 are the amazing Star Beds which allow you to sleep out under the Botswana stars. With no light pollution the star gazing here will blow you away and the star beds means you can do it in style! Nkwichi, is a really wonderful secret that we are not sure we want to share – but we will! It really is a wonderful paradise tucked away on the beautiful shores of Lake Malawi. There are 8 secluded beaches set along a stretch of the beautiful Rift Valley coastline which are all around Nkwichi. Not only do you have easy access to stunning beaches and crystal clear warm waters along the lake but also to some untouched wildlife and inland scenery. The accommodation at Nkwichi is also very romantic as you stay in lovely chalets and house set around the resort. Tucked away in the treeline, each chalet is unique. All individually are individually designed and built using local materials to blend in to their surroundings, they deliver absolute luxury in a natural setting. This means they are really private and romantic with 4 poster beds and rock-pool baths carved out of local boulders and all of them have mesmerizing vistas of the lake. Nkwichi is also home to a fabulous star bed which means you can also sleep out under the stars. If you don’t fancy that then you can still enjoy a private dinner on the beach. 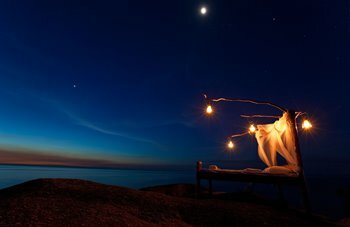 Lake Malawi is often called the Lake of Stars so it really doesn’t come more romantic than that! Where should I go on safari? It’s cold. It’s wet. It’s dark. At this time of year, it’s only natural that thoughts turn to holidays! 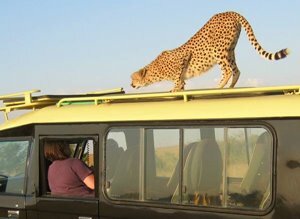 If you’re having a destination dilemma, and are tempted by a safari, read on – you’ll find the top ten questions we get asked at travel shows every year (with answers.) It might just help you narrow the selection down! In the entertainment world the New Year is punctuated by a series of glittering awards ceremonies – in January you have the Golden Globes, followed by the BAFTAs and then of course it’s the Oscars at the end of February. In travel, it is our busiest time of year with wall to wall travel shows, brochure requests and enquiries galore – so we are just as busy but possibly not quite as glamorous! Travel Shows offer a great opportunity to find out everything you need to know about your destinations of interest. You can pick up brochures on a whole range of places and experiences, ask the experts your burning questions, and enjoy presentations on world food and travel in the celebrity and destination theatres. Here are some of the most common questions fired at us during the travel shows (with abbreviated answers – if you want the ‘full’ answer , do give us a ring on 01603 283 517). Where should I safari in 2016? Here goes with the top ten questions. Q.Where’s the best place to catch up with the migration? A.Kenya’s Masai Mara or Tanzania’s Serengeti (depending on time of year). Take a look at this classic tented safari holiday, put together with the Migration in mind. Q.We’re on a budget – where do you recommend? A.South Africa and Kenya currently offer the best value in Africa. 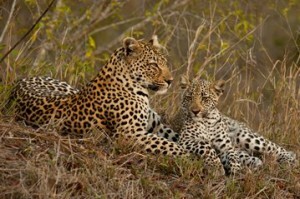 This 19 day trip to South Africa, including a stay in a tented camp in the Greater Kruger is fantastic value. Q.We’re looking for a once-in-a-lifetime journey. Where do you recommend? To be honest, if you go once, and do it right, we know you’ll be smitten and desperate to return to Africa! 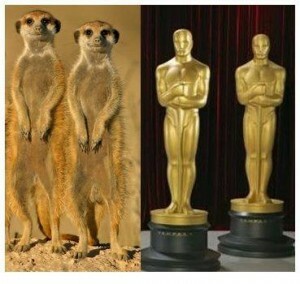 Q.We’ve travelled lots in Africa and are after something completely different? A.Namibia or Ethiopia will make a big impression. 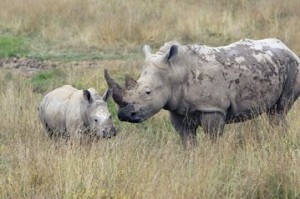 Q.Where can I see rhino? Q.Where can we have an adventure? 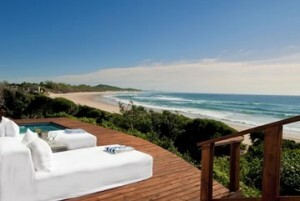 Q.What do you recommend for a classic safari and beach holiday? A.Tanzania is wonderful – combine a classic Northern Circuit with the Spice Islands of Zanzibar or Pemba. Or get off the beaten track, and head to the vast southern parks of Selous and Ruaha, followed by the mainland coast or rustic Mafia Island with its marine reserve. Alternatively combine a safari in South Africa’s Kruger with the beaches of Mozambique, or safari in Zambia before chilling on the shores of Lake Malawi. Got more time and a bigger budget? Try Botswana and Mauritius, or Kenya and the Seychelles. Q.Where can we tick off the Big Five? A.Kenya is your absolute best bet. We even have a sample holiday called The Big Five! Don’t forget the Big Seven – head to South Africa for that! Q.We want to see leopard – where do you recommend? Q.What’s the best time to go? 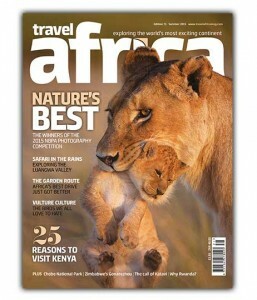 A.Sub-saharan Africa covers a vast area so it depends where you are going and what you would like to see! As a very general rule the peak months for Botswana, Zimbabwe , Zambia, Namibia, Mozambique and South Africa’s Greater Kruger are May to October. For East Africa the peak months for safari and beach are December to February and June to October while the weather in Ethiopia and South Africa’s Cape would be best November to March. The peak months for gorilla trekking in Uganda and Rwanda tend to be between June and September, the long dry season. There’re just 10 days to go till Christmas Day. Are you stuck for gift ideas? Here’s our Top 10 Wild Christmas gifts for that ‘hard to buy for’ person in your life. Find out more about gorilla trekking in Uganda and Rwanda here. 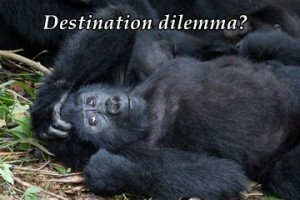 See sample gorilla trekking safari holidays here. Read Lily’s account of gorilla trekking here. 2.Mistletoe moment – fall in love with Africa and give a subscription to Travel Africa, the world’s only magazine dedicated to exploring Africa, from £15. Check out their subscription offers here. Read about Robert’s experience in Tarangire here. Find out more about hot air balloon safaris and other unforgettable safari experiences here. 4.Christmas Cracker – traditional cool, colourful cotton Kenyan Kikoys (try saving that after a few sherries) from £25. We love these ones from Blue Summer. 5.Flight of Angels – fly high over Victoria Falls, from £100 – £180 per person. A fabulous way to take in the full drama of this natural spectacle. See a video of the Flight of Angels here. There are many excursions from Victoria Falls – you can get some ideas here. 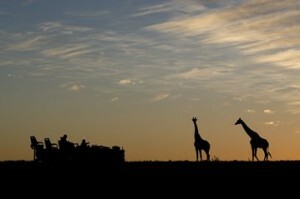 See sample safari itineraries in Zimbabwe and Zambia. 6.Trumpet Fanfare – adopt an elephant, from US $50 per year. Enjoy monthly emails updating you on your elephant with pictures and videos. 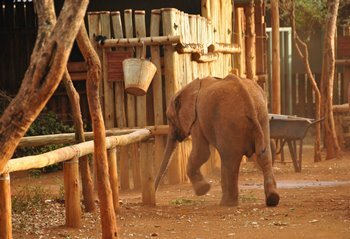 Find out more about the David Sheldrick Wildlife Trust fostering programme here. Read about Kithaka and Arruba, the elephants fostered by the Real Africa Trust here. 7.Give a Great White Christmas – adventurous cage diving in South Africa from £120 per person. It might not be the most obvious thing to give your loved one, but cage diving with a Great White in South Africa’s glorious Cape is sure to be an unforgettable experience. 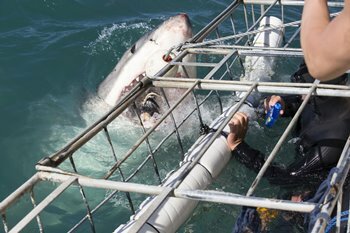 Cage diving can be easily added to any tailormade safari in the Cape. 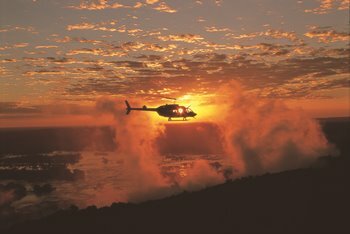 Find out more about our safaris and holidays in South Africa here. 8.A Night with the Stars – sleep out under the great African night sky from US $625 per person per night. Romantic, wonderful, unforgettable – this is a real Christmas cracker. There are many lodges offering a star bed experience including Loisaba and Serian in Kenya, Little Kulala in Namibia, Tswalu in South Africa, Baines and Jao Camp in Botswana. 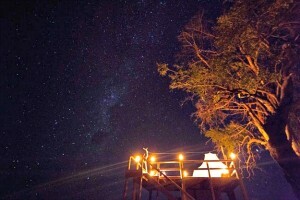 We love Nkwichi on Lake Malawi and the Dove’s Nest at The Hide in Hwange. Read our blog about the best star beds in Africa here. 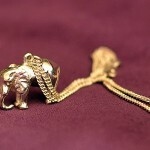 9.Jumbo Bells – Real Africa silver elephant pendant, from £140 each. These beautiful hand-finished eles, as worn by Saba Douglas-Hamilton, are made by jeweller, Penny Price and were specially commissioned by Real Africa for our 15th anniversary. 30% from each and every one (all the profit) is donated to conservation charity Save the Elephants. To find out more or to order online please click here. Please note: due to overwhelming demand we are now looking at New Year deliveries! 10. Gold, Frankincence, Myrrh …and travel show tickets of course – let Brian Jackman, Monty Halls and other travel experts inspire you in the travel theatres and spend your day consulting the specialists about your future travels plans. Compliments of Real Africa. Request your complimentary tickets to the new Telegraph Travel Show or Destinations Manchester or London here. The new BBC1 series The Hunt, narrated by Sir David Attenborough looks at predation in the natural world. Viewers are transported at 9pm on a Sunday evening to a range of wonderful locations around the world to witness real-life dramas unfolding before their eyes. Credit: BBC/Silverback Films/Huw Cordey. Filming wild dogs in Zambia. Executive Producer Alastair Fothergill writes on the BBC website, “the kill itself isn’t interesting, because once animals have killed, the story’s over. 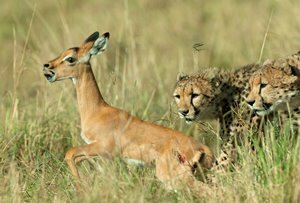 What is interesting is the build up, the strategies adopted by both the predators and prey. This has never been looked at in detail, and that is the aim of The Hunt”. At the Conde Nast Luxury Travel Fair, where we exhibited in November, we were lucky enough to enjoy a talk in the Expert Theatre and meet BBC wildlife cameraman Doug Allan, who worked on Blue Planet, Planet Earth and Frozen Planet, also produced by Alastair Fothergill. Doug told us that it takes on average 450 days of filming to get enough footage for a one hour episode. Taking such stats into account the team here at Real Africa has even more reverence for the BBC’s latest sensational wildlife series. Catch the next episode of The Hunt, Nowhere to Hide, on BBC 1 on Sunday at 9pm. The episode follows cheetahs, bald eagles and lions on their hunt for prey in the exposed plains landscape with much of the 60 minutes filmed in Africa. So where are the best places in Africa to see some of The Hunt’s leading ladies? Cheetahs are diurnal, hunting in the morning and afternoon, and can be seen perched on termite mounds, rock kopjes and even on safari vehicles on occasion in order to survey the horizon – they can see prey 5km away and accelerate from 0 to 64kmh in just three strides. The Hunt filmed cheetahs in Kenya’s Masai Mara – we would recommend the Mara or the Serengeti to see these beautiful cats in action. Real Africa clients get closer than expected! Leopards are more tricky to see being nocturnal and relying on ambush. They need to get within 4m of their prey to be successful. Leopards are most often spotted draped in umbrella acacias in East Africa or on night drives when their eyes shine brightly. 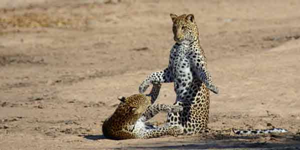 Zambia’s South Luangwa is a fantastic place to see leopard as is Sabi Sands in South Africa’s Kruger. Leopard siblings playing taken by guests Diana & Walt at Nkwali, Zambia. Lionesses …well, put it this way, I don’t know of anyone who hasn’t seen a lion/lioness in the Masai Mara. The Marsh Pride were made famous by the BBC Big Cat Diary series and can still be observed hunting in the Mara along with many other prides. The Hunt filmed specific lion behaviour, as they stalked zebra in Namibia, in Etosha, another excellent place to see them, especially during the peak of the dry season in September and October when game congregates around waterholes. 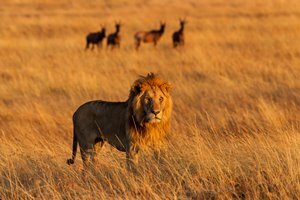 When it comes to lions, you have a great choice, from Kenya and Tanzania, or the lions of Duba Plains, Botswana to the prolific Luwi Lions of Zambia’s South Luangwa, or Cecil’s offspring in Hwange National Park, Zimbabwe. You can even see them in trees in Tanzania’s Lake Manyara National Park and Uganda’s QE National Park. See Real Africa footage of lions hunting buffalo in Tanzania’s Ngorongoro Crater. Lion cubs try out stalking – picture taken by our guide Gaudence. 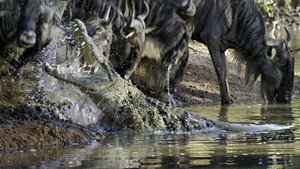 Nile Crocs– Get to the Grumeti River in the Northern Serengeti between July and September and you will see plenty of giant Nile Crocodiles feasting on wildebeest as they make the crossing from one side to the other enroute to Kenya’s Masai Mara. Murchison Falls in Uganda is another great place to observe these beasts. Credit: BBC / Silverback Films / Huw Cordey. Nile Crocodile taking wildebeest on the Grumeti River. Ethiopian Wolves– With only around 500 of these long-legged fox-like creatures remaining in the highlands of Ethiopia, you have to be lucky to get a glimpse. Give yourself every chance by staying in the Bale Mountains at the wonderful Bale Mountain Lodge. Elusive Ethiopian Wolf in the Bale Mountains. 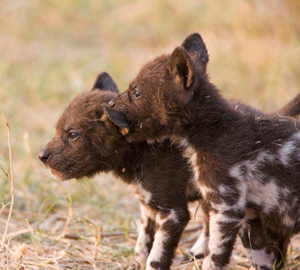 Wild Dog Pups taken from Kwando Lebala. Watching wildlife is of course, unpredictable so although we can’t guarantee you’ll witness a sequence like the cheetah taking a wildebeest calf during your safari holiday, we can ensure we use our expert knowledge, experience and wonderful guides to get you to the best places at the best times for what you want to experience. Here are our Top Five recommendations for places to catch some serious safari action. The Serengeti promises a special safari whenever you go, with the wildebeest migration making its circular journey year-round . However, the southern plains of the Serengeti play host to calving season during January and February and is said to be the best place in the world to observe cheetah hunting. During a dramatic 3 week window, starting in late January depending on the arrival of the rains, the wildebeest have their calves with thousands being born daily, long legged and unsteady as they take their first steps on the short grassy plains of the Serengeti, their nursery. During these key few months, this area of the southern Serengeti and western Ngorongoro Conservation Area is home to Africa’s densest concentration of predators. The big cats patrol the grassland waiting for an opportunity to strike. Cheetah sightings are especially good along with large prides of lion while other predators like hyena and caracal can also be seen. If you are keen to witness stalking behaviours then heading to the area around Ndutu in February would be our number one recommendation – many would say that this is the absolute best time to be in the Serengeti. Mobile camps come into their own, moving to be within reach of the migration and offering an authentic ‘Out of Africa’ safari experience. Our favourites include Alex Walker’s Serian Serengeti South, Lemala Ndutu Tented Camp and &Beyond’s Serengeti Under Canvas. Mobile camps are seasonal tented camps which move depending on the location of the herds. If you prefer a permanent camp then we would recommend Ndutu Safari Lodge, Lake Masek Camp and Sanctuary’s Kusini Camp but there are several lodges and camps in this area so do ask! The Masai Mara is synonymous with big cats. The Marsh Pride came to life on our screens during the BBC Big Cat Diaries – you can even stay, like the BBC film crew did, at Governors Camps in the Mara, well placed for visiting the Marsh Pride. 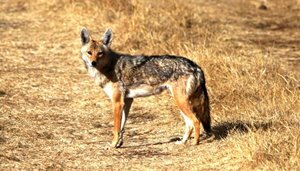 Several big cat projects are based in the Mara including the Mara Predator Project, the Mara-Meru Cheetah Project as well as a Spotted Hyena research centre so this is a indication that the area is rich with wildlife. Research in the 1990s by Joseph Oguto showed that there were roughly 3 lions per 10 square kilometres in the Mara, the largest pride of 48 being the Talek Pride. It is true that lion numbers have dropped by around a third in the last twenty years, as they have all over Africa but the Masai Mara is still one of the very best places to see these beautiful big cats. Visit the Mara between July and October when the Great Wildebeest Migration is in the vicinity and chances are you may see something very special. We recommend staying in one of the private concessions as opposed to within the National Reserve itself. The main reserve has many lodges, often quite large ones, and as such can see high vehicle densities at peak times. In the private conessions which work in partnership with the local Maasai communities, visitor numbers are restricted to 1 guest to around 350 acres allowing for a more exclusive experience. You’ll find lovely small lodges, classy mobile tented camps like Saruni Wild and Alex Walker’s Serian as well as affordable riverside camps like Karen Blixen Tented Camp on the Mara River, one of our favourite ‘good value’ tented camps in the Mara North concession, which bridges the gap between the tiny, top end lodges/camps and the larger 3 star lodges/camps in the national park. For observing predators and their prey the Masai Mara is a fabulous place to safari. See Real Africa footage of cheetah hunting. 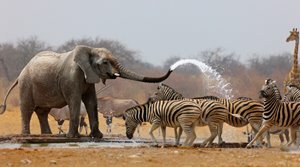 The best time to be in Etosha for wildlife is in the peak of the dry season when vast numbers migrate to waterholes (August – October). As the dry season progresses the landscape becomes increasingly arid and by October, the hottest month, can be quite dusty. It is at this time that the BBC film crew captured the incredible footage of lions hunting – with the swirling dust storm confusing their prey and masking their scent. Many of our clients choose to explore Namibia on a self-drive itinerary over 16 or so days with a 4×4. You can also explore with a flying safari. You may be interested in our blog, Namibia – In the Driving Seat. 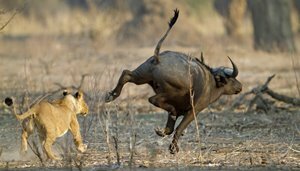 Duba Plains in Botswana is famous for its clashes between lions and buffalo in particular. 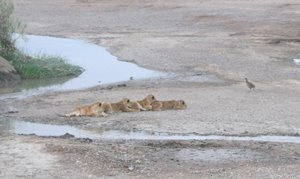 The special thing about the Duba lions is that they hunt during the day allowing visitors to witness them at work rather than simply lazing in the shade. Many will remember the film made by the Jouberts about the lions of Duba and it is a stay at the Joubert’s camp, Duba Plains, with just six ensuite tents that will get you close to the lions here. When the film was made there was one big pride, the Tsaro pride but in the last few years this pride has split into two so interactions in the area are transforming all the time and are rather unpredictable. However Duba Plains is still rated one of the best places to see lions hunting. Safari elsewhere in Botswana and I don’t think you will be disappointed. Linyanti is a good choice for seeing predators with the guiding teams focused on finding lion, leopard and cheetah – night drives are possible from Lebala Camp which sits in a private concession and wild dogs den in the area. Lebala is on the plains/marsh and combines well with sister camp, Lagoon, which sits on the banks of the Kwando river. If Botswana is of interest to you, you may enjoy our country guide called Botswana – Wilderness & Wildlife. South Luangwa is a fantastic place to see predators. The Luwi Sand River, close to Nsolo Bush Camp is where several lion pride territories overlap, while leopard use the dry river bed a bit like a super highway. 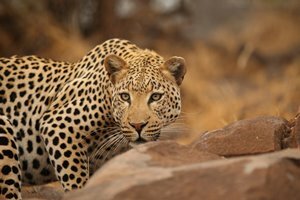 South Luangwa is one of the few National Park’s allowing night drives with trackers and spot lights which gives you a good chance to see leopards actively hunting. This area is very unspoilt with few vehicle tracks in the area and much of the exploration done on foot with guided walking safaris. Accommodation is in seasonal bush camps which are erected for the duration of the dry season between May and October time. This means minimal disturbance to the environment and as a result wildlife is prolific. For lion, leopard, spotted hyena and wild dog (if you are lucky!) this area is truly fabulous. DID YOU KNOW? 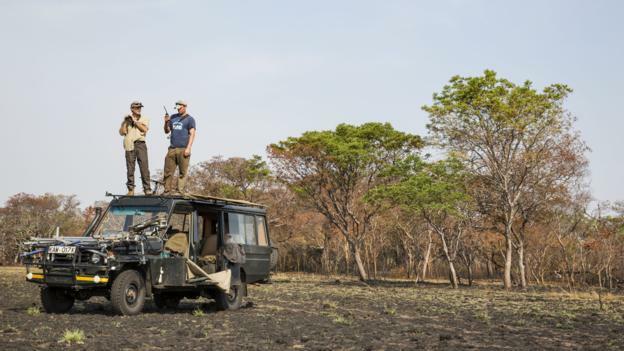 BBC wildlife cameraman, Simon King, and crew stayed at Robin Pope’s Nsefu Camp in the Luangwa’s Nsefu sector when filming lion hunting buffalo. Tell us what you are keen to try and see and we will be able to give you independent advice on the best time of year, the best guides and the best lodges/camps to visit in order to realise your specific ambition. You can call us on 01603 283 517. With the upcoming talk at the RGS, given by wildlife film-maker and elephant expert Saba Douglas-Hamilton, in mind, one of our directors Robert talks about some of his elephant encounters over the years. I love elephants. Whenever I’m in Africa checking camps and visiting suppliers I always make time to game-drive and a priority is to see some eles. To me it is Africa. If I’m in Amboseli it’s one of the most iconic images of the continent, elephants standing before a snow-capped Kilimanjaro. If I’m Tarangire, I love sitting watching a large herd slowly wend their way through the Park. Its watching them interact that makes them so special. In the Mara last year with George, one of our most experienced and popular guides, we spent a very amusing 20 minutes watching a young baby, only a few weeks old, pester its mother for a drink of milk. She was having none of it but was finding it very hard to stop her offspring who was small enough to walk under her and between her legs. Eventually she gave in and he got his drink. Over the years I’ve also been charged several times by elephants. Happily the oldest of these aggressors was probably about a year old and had they hit the vehicle they would have bounced off. Heads shaking and nodding, trunks waving, they’ve left the safety of mum and head at high speed towards us. After a few metres they usually stop, give us a good stare to check if there’s been any reaction. When they see none, they glance over their shoulders, realise mum is now quite a way away and beat a rapid retreat. All good practise for their adult years. Sometimes you get lucky, although the better the guide the luckier you tend to get. You’re parked up, quietly watching a family herd and they slowly envelop the vehicle as they graze closer. It’s extraordinary to be so close that you can see the texture of their skin, almost count the bristles on their bodies and hear them gentle talk to each other through quiet rumbles. Watching them grasp grass with their trunks, sometimes using their toes nails as a scythe to cut through the tougher stems. I was once with my family at Shamwari, a lovely private reserve in the Eastern Cape of South Africa. We were surrounded by a family and a young female stopped by our vehicle. You could see her looking at us and her gaze settling on my 7 year old daughter. Very slowly she raised and extended her trunk until it was only a few centimetres from her face. It gave a gentle sniff, moving gently up and down her body. It repeated this several times before moving on. My daughter, 10 years later, still talks about this, commenting that at no point was she scared or worried, just that she’d wanted to shake its trunk as a greeting. The most interesting thing I’ve seen elephants do was also one of the most puzzling. Having got out of a marsh in Amboseli, an elephant spent several minutes getting a stick carefully positioned. It then stood on one end and used a pointed bit on the other end to clean mud from under its toenails. Everybody loves elephants. Tragically this hasn’t stopped the greatest crisis that they have ever faced developing. Poaching for ivory is at the greatest level it has ever been, driven by the demand for ivory in Asia. Tanzania recently reported that it had lost over 40% of its elephant population between 2010 and 2013 and this is a country with designated National Parks, rangers and a strong conservation presence. In countries like the Congo it doesn’t bear thinking about what has happened to the elephant population where there is little anti-poaching infrastructure. Near annihilation is a realistic and sobering assessment. That is why Real Africa has chosen the ‘Save the elephants’ charity as its partner charity for its 15th anniversary year. The work they do, increasing our understanding of elephants, is crucial if they are to survive. This research, mostly done in Samburu National Park in Kenya, is applicable to help the elephant population across the continent. The talk by Saba on the 8th October at the Royal Geographical Society will raise funds with the proceeds of the ticket sales all going to the charity. We will also be promoting ‘Save the elephants’ at all the consumer shows we display at throughout the autumn and spring, raising awareness and funds. We are delighted to be working with such a dedicated and passionate group of people. Hopefully it will go a small way to ensuring that when my daughter takes her children out on safari in years to come, they too will have the chance to be sniffed by an elephant.